TSN Toronto reporter Mark Masters checks in daily with news and notes on the Maple Leafs, who held an optional practice at TD Garden on Friday. The Toronto Maple Leafs have held two optional practices this week and William Nylander has been on the ice both times, one of o​nly a handful of regulars putting in extra time on the ice. "Just handling the puck and stuff like that, keeping it 100 per cent," he said. Nylander will often use a weighted stick before practice in order to improve his touch. At Tuesday's optional workout he was repeatedly working on plays in tight to the net. He says that feel for the puck is what eluded him at times during a rocky regular season. "That’s what was missing and, I mean, just getting the full mojo back and the confidence so that was a big factor," he explained. "Feel and feeling like you can make plays and stuff like that. That was growing and growing throughout the season." Nylander never seemed to sustain his top level of play during 54 regular season starts finishing with just seven goals and 20 assists. The contract stalemate that cost him training camp and the first two months of the year left him out of sorts. But as he plodded through the worst scoring drought of his life, Nylander was always anticipating this moment. "That was my goal throughout the entire season … to get ready for the post-season and get ready for when it starts," he said. The playoffs give Nylander a chance to dramatically change the narrative about his season. "It’d be huge," he said when asked what a big playoff push would mean for him. 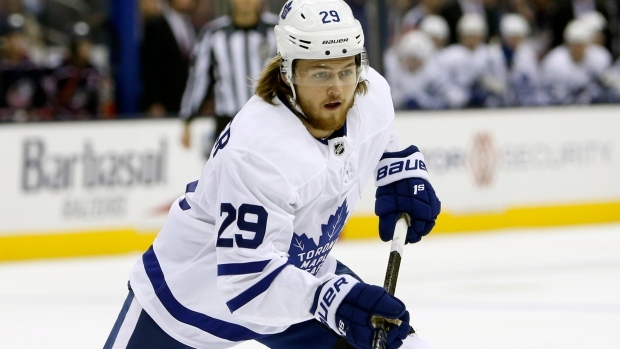 Right now, it feels like the slate has been wiped clean and Nylander has a fresh start. "It's a little different," he said of what he's feeling these days. "I mean, postseason, everything means so much so just been looking forward to that and now we're here." It feels different and in Game 1 it looked different. Last year, Nylander struggled to break through against Bruins captain Zdeno Chara, but on Thursday he used his speed to draw an interference penalty on the big defenceman in the third period. "He couldn't really do much, it would've been maybe a breakaway so he kind of had to," Nylander said. Nylander currently skates on Toronto's third line meaning easier matchups and fewer shifts against Chara. On Thursday, he took advantage of that freedom. Late in the second period, Nylander was sprung on a breakaway and beat Tuukka Rask to make it 3-1. Why did he go five-hole? "Didn’t really see that much so just tried to get him when he wasn’t ready for a five-hole shot," the 22-year-old said. Nylander also scored in Toronto's last regular season game, meaning he's now potted goals in consecutive outings for the first time all season. It's a huge confidence boost for the Swede, who only had one goal in last year's playoffs. The key lesson from that bitter seven-game setback against the Bruins? "It just shows you how important every game is," Nylander said. "We didn't come out ready for the series last year, we were down 2-0 off the bat and then we battled back for Game 7 so everything is so important in the playoffs." Based on Game 1 this year, it appears Nylander and his teammates have made the necessary adjustments. Left winger Trevor Moore logged just 6:40 of ice time in his NHL playoff debut on Thursday but certainly made an impression on Chara, rocking the Bruins captain with a huge bodycheck. "He's a guy that I have tremendous respect for and a guy that I watched growing up," said the 24-year-old California native. "It's kind of surreal to be on the same ice with him, but you can see he's still a good player out there and a guy we have to be physical on and try to shut down and be hard on." Moore stands five-foot-10, 182 pounds so was he surprised to be able to knock over the six-foot-nine, 252-pound Chara so forcefully? "I didn't think I was going to be able to hit him as hard as I did, honestly," Moore admitted. Any reaction from friends and family? "My cousin sent me a video of it this morning," he said with a smile. "They had a good time with it, for sure." Playing in his first career NHL playoff game, Leafs rookie Trevor Moore used his skating ability to pressure the Bruins defence, and even got a hard hit on towering defender Zdeno Chara, which surprised the 24-year old. The Leafs succeeded in not only containing Boston's dynamic top line at even strength, but actually outscoring the trio of Brad Marchand, Patrice Bergeron and David Pastrnak. That line had terrorized Toronto in last year's playoffs, but on Thursday the Bruins were outshot when each of those players were on the ice in five-on-five action, per Natural Stat Trick. "We did a good job tracking them," explained Jake Muzzin, who led Leafs defencemen in ice time against the Boston top line. "I didn’t find there was a lot of rush chances from them." The John Tavares unit with Mitch Marner and Zach Hyman did a lot of the heavy lifting against the Bergeron brigade and Bruins coach Bruce Cassidy started to use his last-change advantage to get his most potent weapons away from Toronto's top line in the third period. So, it could be Auston Matthews who sees more of that matchup in Game 2 on Saturday night. Leafs coach Mike Babcock anticipated this possibility and in the final few home regular season games hard matched Matthews and not Tavares against top lines to help ready the 21-year-old for the challenge. "We set Auston's line against (Aleksander) Barkov when Florida came in," the coach reminded reporters. "We did that down the stretch to prepare for these opportunities. The bottom line is you got to stay patient. Lots of times when you’re a good player you don’t score right away in the playoffs. It doesn’t look like it’s going good, people are evaluating you. Don’t worry about what everyone thinks, just do your job and in the end it will go your way. Be patient with what you’re doing and grind. Work." The Leafs outscored the Panthers (1-0) and had more scoring chances (7-5) when Barkov and Matthews shared the ice at even strength during that late-season clash. But that test against a Florida team playing out the stretch likely won't come close to the challenge presented by Boston's best. ​"They're extremely skilled and Bergeron's really good in his own end, defensively," Matthews observed, "it kind of allows them to take chances offensively and go on odd-man rushes. And all three of them have extremely good skill, all three of them can make plays, they're always looking for each other, so you've really got to key in and make sure you're not giving them those odd-man rushes all the time. They're going to make you pay." "It gives you confidence, but you also know they're going to come out tomorrow and they're going to be fired up," Matthews said. "They're the No. 1 line in the league this year so you can't take that for granted, because they've got veteran guys on that team and they're going to come out tomorrow night and they'll be ready to play, and we've got to be ready as well." Patrice Bergeron found the back of the net on the power play in Game 1, but overall the Leafs feel confident in the job they did slowing down 'the number one line in the league' and are looking for the same effort in Game 2. After taking some big hits in Game 1, Bruins winger Jake DeBrusk sat out Friday's practice. "Jake was given a maintenance day," Cassidy told reporters at the team's practice facility, "and he’ll be back with us, we assume, tomorrow morning. If he’s not feeling well, we’ll have to put (David) Backes in and juggle the lines around, but right now, we anticipate he’ll play." It's possible that the 34-year-old Backes could make his series debut even if DeBrusk is in. "I thought about going with Backes in Game 1, but we made the decision that we have to check fast against Toronto," Cassidy said. "There are two ways to slow them down ... They’re a fast team, and you can physically slow them down, or you can skate with them to slow them down. I thought we’d do a better job checking with our legs skating than we did last night. What I mean by that is them getting behind us and them coming through the neutral zone with speed. There were times where we did a real good job of it and our legs were good on the forecheck. Other times, they weren’t. “Obviously, David adds a physicality piece. We will have an internal discussion as to whether that is a better plan of action."